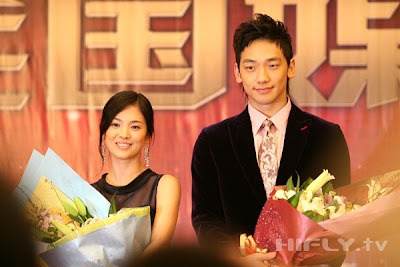 Actress Song Hye-kyo and singer/actor Rain will visit China to promote their drama Full House, which aired on KBS 2TV a few years ago in Korea. They will leave Seoul Thursday for a 3-day visit to Hunan, China, where a news conference and a fan meeting are scheduled ahead of the drama’s local airing. Song’s manager Na Byung-jun of Sidus HQ says inquiries by Chinese fans about their visit are pouring in. If you’re interested in the latest updates regarding this joyous event, go to AgentP’s Headquarters. This entry was posted in News and tagged Bi/Rain/Jeong Ji Hoon, Full House, Song Hye Gyo by doozy. Bookmark the permalink. Me too. Ha Ji Won did such an excellent job as HJY. Love her. Aside from liking SHK, that’s the other reason why I’m really looking forward to watching the movie. From the poster, it seems that the storyline’s focus of the movie will be different from that of the drama. song hye kyo’s hwang jini seems different from the tv series.I’m going to buy a dvd copy once it’s released.I’m so excited to see it. have u seen the movie’s preview? it looks good!